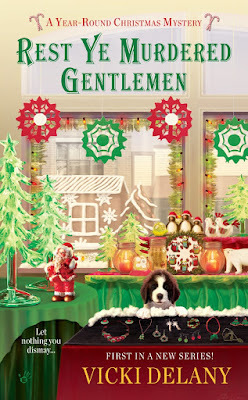 by Merry Wilkinson from Vicki Delany’s Rest Ye Murdered Gentlemen, the first Year Round Christmas Mystery. I am the proud owner of Mrs. Claus’s Treasures, on Jingle Bell Lane. I stock everything you need for holiday decorating, as well as gifts such as jewellery and a special line of toys. Many of my goods are things you won’t find anyplace else – hand made by local artisans. This year I have high hopes for winning the best-in-parade trophy for my Elves Workshop float. The stiffest competition will be from the Victoria’s Bake Shoppe float. Vicky is my best friend since kindergarten. Except around parade time. Then I hate her, because she usually wins the trophy. Now, as soon as George gets his darted tractor started, my lovingly-decorated float, full of the kids from my mom’s vocal classes dressed as elves, will join the parade. Oh, oh. George is climbing down from his seat. He’s opening the front flap of the WWII era tractor that belongs more in a museum than pulling a float. Men are gathering around; they’re all peering into the mysterious depths. George is scratching his head. The parade is going ahead without me! Rest Ye Murdered Gentleman will be released on November 3rd and is now available for preorder from Amazon, B&N, and all booksellers. As a Christmas gift to YOU, I'm having a draw for this small tree decoration, featuring Matterhorn, Merry Wilkinson’s Saint Bernard puppy. As shown! (Entries from Canada and US). Leave a comment to be considered for the draw. Vicki Delany also writes as Eva Gates. Rest Ye Murdered Gentlemen sounds like a fun cozy mystery (and its the first in the series)! I have added it to my TBR list. (I enjoy seasonal/holiday theme cozy books.) Thank you for the ornament giveaway. I am so looking forward to this mystery! No amount of lurking at my library website has made it available yet for the hold list! :) I enjoy those holiday cozies! Thanks! I love cozies, and I love Christmas. This series sounds tailor-made for me! So glad it will be out before the holidays really get hectic , so I can sit with it by the fire. I forgot my email! I was so excited. Thanks for entering everyone. Isn't that a cute little stocking? I hope you don't object to what might seem like early Christmas promotion, but the book comes out in November, so I wanted to introduce it to you all. Count me in. I enjoy getting in on the ground floor of a fun series. Dz87507 at gmail dot com. Matterhorn is very cute! Another book to add to my list. I love Christmas themed cozies! Very cute! I love Christmas! Can't wait to read this....it's on my list! Thank you for the intro to your new cozy mystery & congratulations on its' release in November! I can't wait for this book to come out. I have had it pre-ordered for months. It brings two of my favoroite things together. A great cozy mystery and Christmas. I am very much looking forward to this book. Thank you for the chance to win the adorable ornament also. Awesome give away. Thanks for the chance. Can't wait to read this Christmas book. Thanks for a chance to win. Love the stocking ornament!! Rest Ye Murdered Gentlemen sounds like a perfect cozy mystery and a great start for a new series. You've put me in the Christmas mood. I can't wait. Your book sounds great too! I don't know about where you people are, but here in Southern Ontario, fall has arrived with a blast. Two weeks ago I was in the pool and today I'm huddled in sweaters. IF it's fall, then Christmas can't be far beyond. Thanks all for entering, a winner has been chosen and contacted!